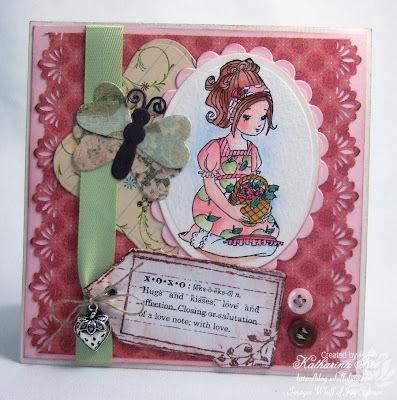 Today I like to show you my first card featuring the brand new Whiff of Joy / Elisabeth Bell Summer Stamp Kit stamp. Thanks for all your lovely mails and comments letting me know that you received and enjoy your new stamps. This means so much to me! I created a diskussion in our Papercraft planet forum, where you can share your creations with the new stamps if you like. Heute möchte ich euch endlich meine erste Karte zeigen auf der ich einen Stempel des neuen Whiff of Joy / Elisabeth Bell Summer Stamp Kits verarbeitet habe. Danke für all eure lieben Emails und Kommentare in denen ihr mich wissen habt lassen, dass ihr eure Kit erhalten habtund dass es euch gefällt. Das bedeutet sehr viel für mich! In unserem Forum bei Papercraft Planet könnt ihr gerne eure Werke mit den neuen Stempeln zeigen, wenn ihr wollt. For the ones of you who didn't pre-order the Whiff of Joy / Elisabeth Bell Summer Stamp Kit, but would like to have some of the stamps - no need to worry - all the stamps will be released as single stamps on sunday, may 24th in the Whiff of Joy online store. Für all jene unter euch, die das Whiff of Joy / Elisabeth Bell Summer Stamp Kit nicht ergattern konnten, keine Sorge - Alle Stempel werden ab Sonntag 24.5. auch als Einzelstempel erhältlich sein. The large butterfly is a QuickUtz die, the sentiment is from Stampin' Up. I stamped it on a tag, which I stamped with a journaling stamp from Prima Marketing. I received the lovely strawberry charm from my dear friend Bev. Thanks for visiting and happy stamping!! Der große Schmetterling ist mit einer QuickUtz Stanzschablone gemacht. Der text ist von Stampin' Up. Den Tag habe ich mit einem Prima Marketing Journaling Stempel gestempelt und dann ausgeschnitten. Den süßen und so passenden Erdbeercharm habe ich von meiner lieben Freundin Bev bekommen. Danke fürs Reinschaun und habt viel Spaß beim Stempeln!! WOW,WOW,WOW,this is gorgeous!!! I received my stamps today and I love them,thankyou! I can't believe they got to Australia so quick,lucky me and I am so looking forward to using them! Great card! So beautiful and elegant. 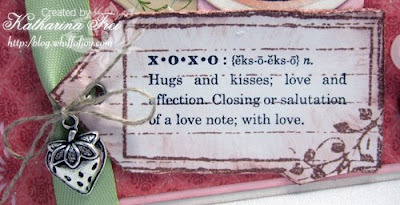 This charm fits the card perfectly...may have to get some of those. Wow - eine wundervolle Karte. Ganz große Klasse. Beautiful card Katharina, the new stamps look so pretty. 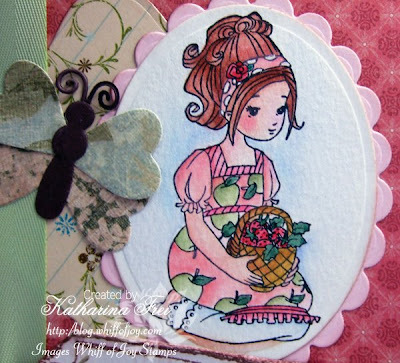 Hello Katharina, I love the butterfly on your card and I love the strawberry charm. This is just stunning. I can't wait for the new release! WOJ are probably my favorite stamps on the market! Viele liebe Grüsse und einen schönen Abend! Fantastic card. All of the new stamps have such sweet faces, I love every one. The strawberry charm is the perfect touch. This is beautiful! I just love her dress, great details on your card, so inspiring! This is gorgeous Katharina! Love these new images! What a beautiful card Katharina,l love the image and colours. Gorgeous card, Katharina! I love the colors you've used. Tfs! Das Tag passt natürlich supersuperschön dazu! Und natürlich die kleine Erdbeere! Der Stempel spricht für sich...supersuperschön!!! This is gorgeous Katharina, love it. You make gorgeous card, this one was really beautiful!! Just wanted to say thanks for all the gorgeous stamps than fell down in my mailbox today!! Love your store and stamps - they are my favorites!! Oh how pretty!!! The girl is fabulous of course, and the card is wonderful. I love the lacy-ness along the sides! So pretty! I can't wait to get my order now! I had kind of forgotten about it, but now that I see the stamps online, I'm really glad WoJ has such fast shipping to overseas locations! Wonderful card. Love your coloring. Gorgeous! Love tht strawberry charm! I think she is my favorite from the kit, not sure though! Wonderful colors too!